A good screwdriver set is the foundation to any good tool set. From home DIY projects to heavy construction work, screwdrivers are a staple in the tool world, and have been since the Middle Ages. You can purchase screwdrivers individually, but it’s typically more cost effective to buy a screwdriver set. 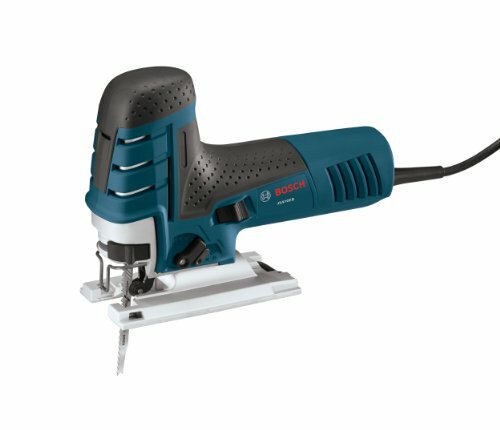 Buying a screwdriver set over individual drivers gives you more options when it comes to working with different kinds of screws. You can also purchase screwdriver sets based on the specific work you want to do, such as precision repair work or work in hard-to-reach areas. Our team has reviewed a variety of screwdriver sets so you can find the right one for you. Don’t forget to check out our buying guide to learn more about what factors we considered, along with what kind of price you can expect to pay for a variety of different options. Read more about our methodology. 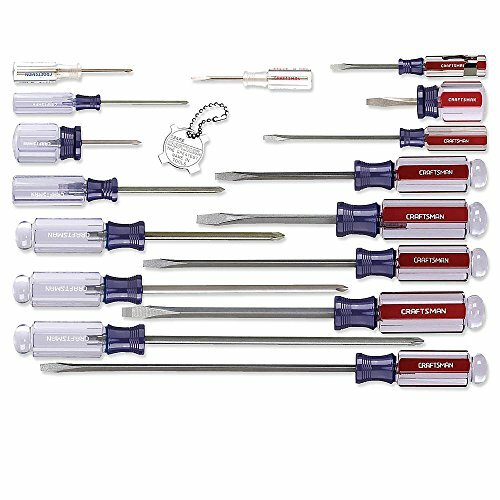 The Craftsman 9-31794 is a screwdriver set that features a good variety of bit options and other convenient features. This screwdriver set is durable and reliable, making it an easy choice for ReviewLab's Top Pick. This screwdriver set also features an exceptional lifetime warranty in case anything goes wrong with the tools while you use them. The Klein Tool 85078 screwdriver set is a premium option for people looking for overall comfort and durability. 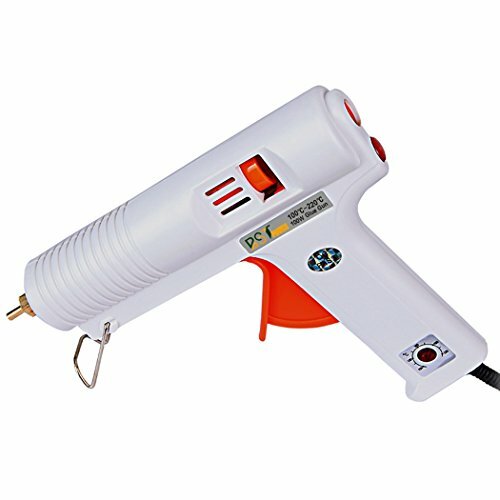 It features eight different screwdrivers for a greater variety of functionality, along with extra-comfortable handles for easier prolonged use. With the included bit identifiers, this screwdriver is a convenient and reliable option for anyone looking for a high-quality screwdriver set. 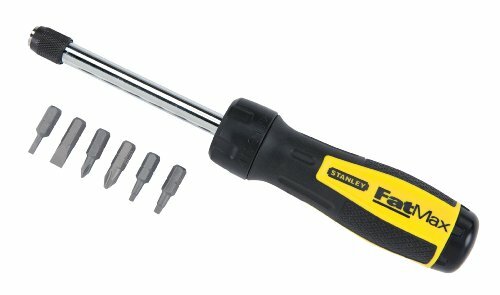 The STANLEY 91-541 is a budget screwdriver set that still provides a good variety of bits and added durability. With magnetic tips and comfortable handles, this screwdriver set can be used in a wide variety of applications. If you're looking for a budget screwdriver set, look no further than the STANLEY 91-541. The Craftsman Extreme Grip screwdriver set is an extra-durable set that features diamond-coated tips and super comfortable handles. These features make this a great budget option for both home DIYers and professionals. This is a reliable screwdriver set for all kinds of projects. The NANCH Precision is a screwdriver set made for precision applications like electronics repair. With a huge variety of interchangeable bits that are also magnetic, this precision screwdriver set is great for anyone looking to break into the electronics repair world, either for personal or professional projects. The ORIA Professional Repair Kit is a precision screwdriver set that features many more interchangeable bits than most other precision screwdriver sets on the market. With all these bits and some advanced features like a flexible shaft and power drill attachment, this precision screwdriver set is a comprehensive and affordable option for anyone needing tools to work on projects that require a more delicate touch. The TEKTON 2841 is a incredibly flexible and durable ratcheting screwdriver set. With a ton of different bit choices and a durable carrying case, this ratcheting screwdriver set is a great choice for anyone looking for a more comfortable and reliable experience while using a screwdriver. The STANLEY 69-189 is a simple ratcheting screwdriver with only six different bits that can handle most of the standard projects. With an affordable price tag and a built-in bit storage compartment, this screwdriver set is a convenient option for anyone that needs a quick and easy-to-use tool around the home or office. 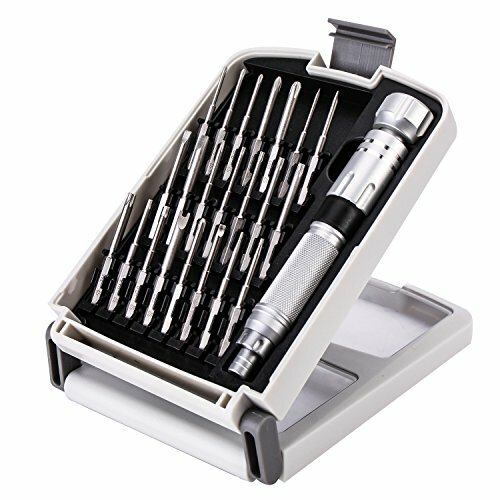 The Performance Tool W80004 is a unique screwdriver set that helps you screw and unscrew in areas that are tight or hard to reach. This stubby screwdriver set is a flexible option that also saves space in your tool bag or belt. They're also incredibly portable and durable. The number of different screwdriver bits (or tips) available is one of the biggest reasons people buy screwdriver sets instead of individual screwdrivers. When you buy a set, you typically receive either a variety of different screwdrivers or a set of interchangeable bits. 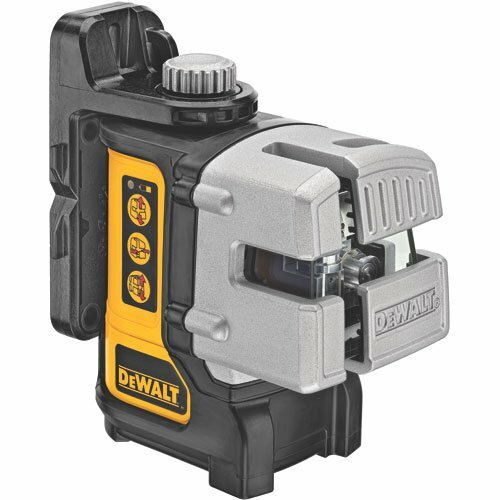 With this variety, you can use your screwdriver set in a variety of different applications, without having to make multiple purchases to do so. Consider what kind of work you want to use your screwdriver set for, and tailor the set you buy around those needs. For example, if you want to repair electronics, you would be better off purchasing a set with precision screwdriver bits instead of a set with standard bits. Any time you purchase a new tool, durability should be one of the most important factors to consider. If the tools you buy break in the middle of a project, you’ve not only lost money, but you’ve also lost time in completing your project. Most screwdrivers are built with steel shafts, but the quality of that steel often decreases the less you spend on the set. If you’re looking for a long-lasting screwdriver set, expect to pay a little more than you would when shopping at the dollar store. If you’ve ever used a screwdriver before, you know how fast extended periods of use can become uncomfortable for you. It’s important that the screwdriver set you purchase is comfortable, especially if you plan on using it for longer periods of time. Typically, screwdrivers with thicker handles tend to be more comfortable and should feature some kind of ergonomic design, mainly in the form of smoothed or rounded edges. Ratcheting screwdrivers tend to be more comfortable than most due to the way they’re designed to allow you to screw and unscrew without having to reposition your hand or screwdriver. Not all screwdrivers are created equally. Again, consider the type of work you want to perform with the screwdriver set you purchase. Many sets include magnetized bits that help you keep screws in place and many others are specifically non-magnetic. There are also plenty of screwdrivers that offer interchangeable bits. If you’re an electrician, you may want to consider insulated screwdrivers for working with live circuits. If additional features are important to you, take those into consideration as you’re looking at screwdriver sets. For under $20, you can buy a budget screwdriver set. These screwdriver sets are typically simple in their offering, without any extra additional features. You can typically purchase a good precision screwdriver set in this price range, as well. In the $20-$50 range, you can buy a screwdriver set that fits the needs of most consumers. These sets typically offer a good variety of bits and sometimes provide additional features like interchangeable bits. For more than $50, you can buy a premium screwdriver set. These screwdriver sets are usually extra durable, extra comfortable and very versatile. Many of the sets in this price range include more than 10 different screwdrivers. The Craftsman 9-31794 set is an incredibly versatile and sturdy option for anyone looking for a reliable screwdriver set. This set offers more pieces than most screwdriver sets on the market, and each piece is durable enough to withstand even the toughest conditions. On the off-chance that one of the pieces fails to meet your expectations, you can take comfort knowing that it’s covered by an exceptional warranty policy. With these features and more, it’s easy to see with this screwdriver set is ReviewLab’s top pick. 17 pieces included. The Craftsman 9-31794 screwdriver set includes an incredibly impressive number of screwdrivers. With 17 different pieces overall, this screwdriver set gives you more flexibility when working on projects that require a variety of options. Many users are pleased that the set also includes varying sizes of the same screwdriver, so you can still get to hard-to-reach places without losing overall functionality. This set even includes a handy four-in-one keychain with four flat screwdriver heads. Durable build. The handles and overall construction of this screwdriver set are sturdy and durable, according to many users’ reviews. The handles are made from butyrate, which is designed for more strength, and many users are happy to report that their sets have held up even in tough conditions. Color-coded handles. The screwdriver handles in the Craftsman 9-31794 screwdriver set are all color-coded based on whether they are Phillips or slotted heads. The Phillips screwdriver handles are all clear while the slotted screwdriver handles all feature a red stripe. This allows you to quickly choose the right screwdriver without having to inspect each head, and it’s one of the most popular features, according to users who review the product. Lifetime warranty. Craftsman has a lifetime warranty on all their hand tools, which also applies to their screwdriver sets. This lifetime warranty, which is much better than the warranties of many other products on the market, allows you to get the set repaired or replaced free of charge if it ever fails to meet your satisfaction. Some users have been able to use this warranty and are pleased with the results. No magnetic tips. This screwdriver set does not feature magnetic screwdriver tips. The Klein Tool 85078 screwdriver set is ReviewLab’s Top Pick Runner Up, and focuses on comfort, durability and ease of use. With eight different pieces, all featuring incredibly comfortable handles, this screwdriver set is sure to provide what you need, when you need. You can also expect to be able to find the right screwdriver every time with Klein Tool’s unique tip identification feature on each one of the screwdrivers in this set. This is a great set for anyone looking for comfort and durability over sheer number of pieces. Eight pieces included. This screwdriver set includes a good number of different pieces for use in different applications. With three Phillips and three flathead tips on standard-sized screwdrivers, along with one of each on stubby screwdrivers, you can rely on this set to have something for almost every situation. Many users report being pleased with the variety available to them with this screwdriver set, and say that they hardly ever need to look elsewhere when screwing or unscrewing. Incredibly comfortable handles. 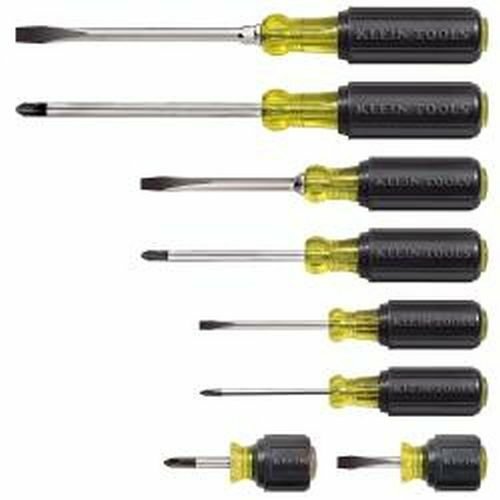 The Klein Tools 85078 screwdriver set features an extremely comfortable and well-made handle on each one of the included screwdrivers. Users report being able to use these screwdrivers for extended periods of time without discomfort because of these handles. In fact, it’s one of the features they like most about this screwdriver set. One glance tip identification. These Klein screwdrivers offer a patented Tip-Ident feature that allows you to easily identify the tip and size of the screwdriver simply by looking at the base of the handle. This system allows you to store screwdrivers like you normally would in your tool bag or belt and get the right size every time without having to look at each tip. Durable and sturdy. Durability is another strong suit of the Klein Tools 85078 screwdriver set. With chrome-plated shafts, you can expect less rust and corrosion over the life of the set. The overall construction is also a point that many users find favorable, stating that their Klein tools always last them the longest out of all their tools. Lacks magnetic tips. If you’re looking for a screwdriver set with magnetic tips, you won’t find them with the Klein Tools 85078. The STANLEY 91-541 is a strong, reliable and versatile screwdriver set that provides a good number of drivers that all feature comfortable handles and durable designs. It also features magnetic tips for greater usability in a larger number of situations. 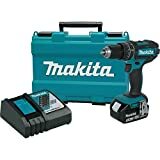 All these features are provided at a budget price, making this set a great choice for homeowners and DIYers who don’t want to spend a fortune on a screwdriver set. A good number of options. The STANLEY 91-541 includes eight different screwdrivers, with two precision options you can use for smaller projects. With three Phillips tips and three flathead tips, this screwdriver set is versatile and flexible, which many users appreciate. Magnetic tips. This screwdriver set features magnetic tips on each one of the screwdrivers. With magnetic tips, you can keep screws in place while you’re screwing or unscrewing, giving you more reliability throughout your entire project. Super comfortable handles. The STANLEY 91-541 screwdriver set features super comfortable, soft-grip handles that make your overall experience better. These soft-grip handles also provide more control over screwing and unscrewing. Many users are pleased with how comfortable these screwdrivers are, even over extended periods of use. Chrome-plated shafts. The durability and reliability of this screwdriver set is apparent in its chrome-plated construction of the screwdriver shafts. This chrome plating redcues the amount of rust and decay that you may experience with the tools. Many users also report that the overall construction of the shaft and handles on this screwdriver set are suitable for long-lasting and reliable use. Magnetic tips not strong enough for larger screws. While this screwdriver set features magnetic tips on all its screwdrivers, many users report that the magnetism isn’t strong enough for larger screws. The Craftsman Extreme Grip screwdriver set features an incredibly comfortable design and unique, diamond-coated tips for greater durability. With a lifetime warranty and extra-durable design, the screwdrivers in this set are great for a variety of applications, including both home and professional projects. If you’re looking for a good budget option with a strong level of reliability, this screwdriver set makes this a good choice for professionals and DIYers alike. Incredibly comfortable design. The Craftsman Extreme Grip screwdriver set features an incredibly comfortable design on each one of the screwdrivers. The extra-wide handle may look clunky at first glance, but many users report having more control and greater comfort while using this screwdriver set because of the handles it features. Diamond-coated tips for greater grip and durability. Each one of the screwdrivers in this screwdriver set features a diamond-coated tip. This feature creates greater grip while screwing and unscrewing, so you don’t lose control. The diamond coating also adds durability to the set. Users report this as the feature they most considered when purchasing this set, and it has consistently been the feature they’ve most appreciated. Conveniently laser-marked shanks. You’ll have an easy time identifying each driver in the Craftsman Extreme Grip screwdriver set with the conveniently laser-marked shanks. These laser markings indicate what type of tip and the size of the tip is used on each driver. With these markings, you don’t have to worry about digging through your tool bag or belt and examining the tips to find the right one. Lifetime warranty. All Craftsman hand tools feature a lifetime warranty that will replace or repair the set if they don’t live up to your expectations. Many users report having used this warranty to replace their screwdriver sets with ease. Not as many tips as other sets. The Craftsman Extreme Grip screwdriver set only features six different tip options, which isn’t as many as other sets. Precision screwdrivers sets are mainly used for repairing and building items that have hard-to-reach or smaller-than-usual screws. These sets are typically best for repairing electronics, clocks and eyeglasses, among other things, and are smaller than typical screwdrivers. They also usually offer more bit variety. If you’re looking for a precision screwdriver set, consider what kind of applications you’ll be using the set for, and consider what bits the set provides. Ultimately, you may want to consider purchasing a precision set that contains a wide variety of screwdriver bits for maximum versatility. The NANCH Precision is a precision screwdriver set that features a good variety of bits for a variety of different applications. These bits are magnetic, for greater control, but not magnetic enough to ruin electronics. This screwdriver set also features unique convenience features such as a telescoping shaft for greater reach and a hard carrying case for greater protection. This precision screwdriver set is perfect for anyone looking for a reliable and flexible option for precise projects. A huge variety of bit options. The NANCH Precision screwdriver set features a huge variety of bit options. With 22 different bits, you can be sure you’ll have all the tools you need at your fingertips for whatever precision job you’re working. The included bits feature Phillips, Torx, slotted, hex, pentalobe, triangle, Y tri-wing and SP2 orientations. All these bits are also easily interchangeable. Magnetic bits. This precision screwdriver set features magnetic tips on each one of the bit options. However, while each of the bits is magnetized, it’s a weak magnetism, making it perfect for electronics work. Many users appreciate the magnetism because it isn’t powerful enough to ruin any of the electronics you’re working on. Telescoping driver. The main driver unit features a telescoping shaft that you can extend for situations that need greater reach. Many users find this feature to be one of the most useful on the entire set because it gives them greater versatility to work on a variety of different projects. Allows for precise control. While the inherent nature of a precision screwdriver sets is for more precise control on more sensitive projects, the NANCH Precision screwdriver set allows for even greater control with a simple spinning endcap. This allows you to turn the driver using only the endcap without having to have a hold on the main body. Included carrying case. This screwdriver set includes a convenient, hard carrying case that contains all the bits and the main driver body. This convenient addition is one of the favorite and most useful accessories to the set, according to many of the users who wrote reviews. Bit identifiers are hard to read. While each bit features a unique identifier, many users report these markings are hard to read. The ORIA Professional Repair Kit is a precision screwdriver set with a ton of different bits that allow you to work with and repair a variety of different electronics and materials. You can easily switch out the bits with a simple-to-use interchangeability feature. The precision screwdriver set also features a number of extra accessories, such as a flexible shaft and an attachment that allows you to use the bits with power drills. This product is a great choice for anyone looking for a versatile precision screwdriver set. Huge number of bit options. 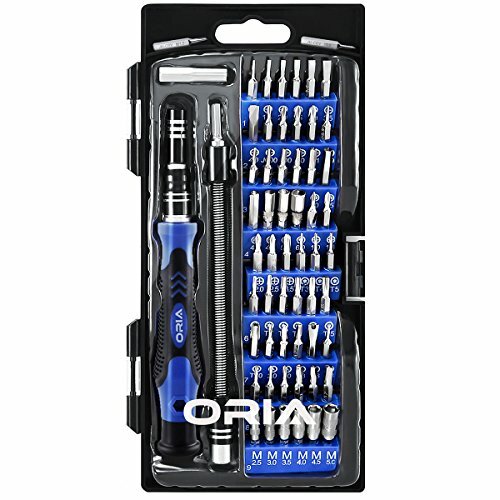 The biggest selling point of the ORIA Professional Repair screwdriver set is the sheer number of bit options available in the set. With over 54 bits, this precision screwdriver set is flexible and comprehensive. Many users are incredibly pleased and largely surprised at how many things they can do with this screwdriver set. Easy interchangeability. With such a large number of bits, it’s important to have an easy way to change out those bits. This precision screwdriver set features a convenient interchangeability option that you pull to eject the bit. This is a popular feature with users since it decreases the time and effort it takes to change out bits. Included flexible shaft. 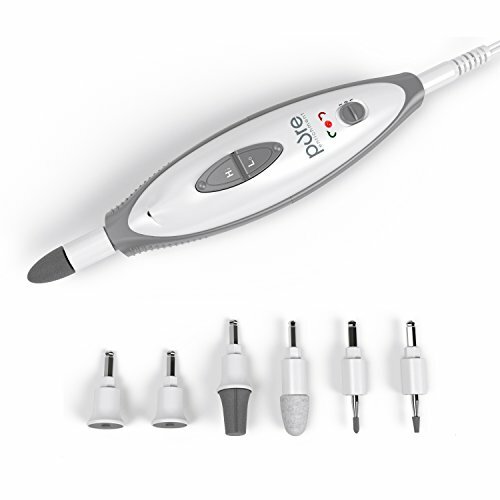 The ORIA Professional Repair screwdriver set also includes a flexible shaft attachment. 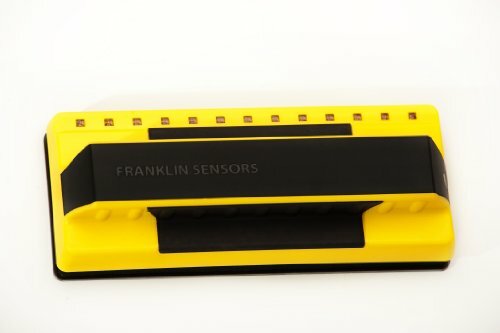 This extension is a great option to have when repairing electronics that have hard-to-reach areas. Many users find this extension to be particularly helpful in a variety of different situations. 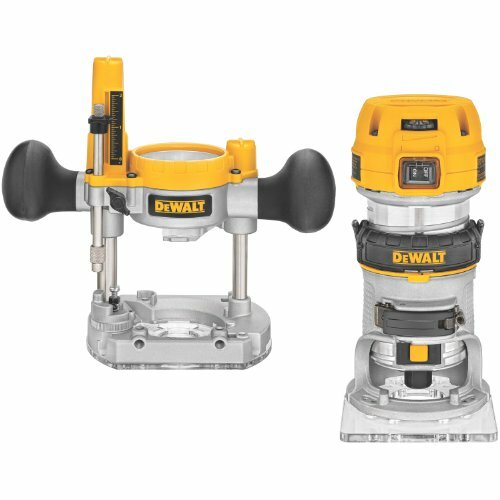 Compatible with power drills. This precision screwdriver set includes an attachment that allows the bits to be used with a power drill. This gives you even more flexibility when using this screwdriver set. Weak carrying case. The included carrying case with the ORIA Professional Repair screwdriver set leaves a lot to be desired. According to many users, the case isn’t as durable as it should be. Ratcheting screwdriver sets allow you to screw or unscrew without having to reposition your hand after each turn, or without having to remove the screwdriver from the head of the screw. This kind of screwdriver helps you work more comfortably over longer periods of time. These screwdriver sets are perfect for more delicate projects when you can’t use a drill, but will require you to spend longer working with your screwdriver. They also tend to be more durable and longer lasting than other screwdrivers since you won’t be exerting as much force on them as you normally would. The TEKTON 2841 is a ratcheting screwdriver set that features a huge number of interchangeable bits. These bits provide more flexibility than most of the other ratcheting screwdriver sets on the market. With the TEKTON 2841, you also get a durable carrying case that stores all the bits and the driver in a single place. With these features and more, you can buy a ratcheting screwdriver set that is both reliable and versatile. Incredibly huge variety of bits. 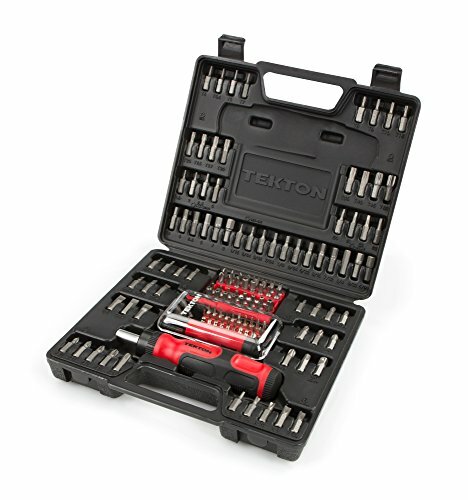 The TEKTON 2841 features a staggering total of 127 interchangeable bits. The included bits service a variety of different applications, including standard screwdriver bits, precision bits and security drive bits. With this number of bits, you can use this ratcheting screwdriver set for almost all your projects, which is a feature many users really enjoy. Convenient ratcheting function. The TEKTON 2841 is a ratcheting screwdriver set, which means you can screw and unscrew without needing to reposition your hand or remove the bit from the screw. This is the main selling point for this screwdriver set. This ratcheting function on this screwdriver allows you to drive forward and backward. It also features a fixed orientation that doesn’t use the ratcheting feature. Includes spudger attachment. Among the huge variety of bits included in this ratcheting screwdriver set, you will find a spudger attachment for electronics applications. Many users are surprised and pleased to find this attachment included with this set. Includes durable carrying case. The TEKTON 2841 ratcheting screwdriver set includes a durable carrying case that protects and transports both the driver and all the included bits. Many users are especially pleased with the durability and functionality of this carrying case. No triangle bits. TheTEKTON 2841 ratcheting screwdriver set doesn’t feature any triangle bits. The STANLEY 69-189 is a simple ratcheting screwdriver set that features six different bits and an extra comfortable handle that also stores the bits. 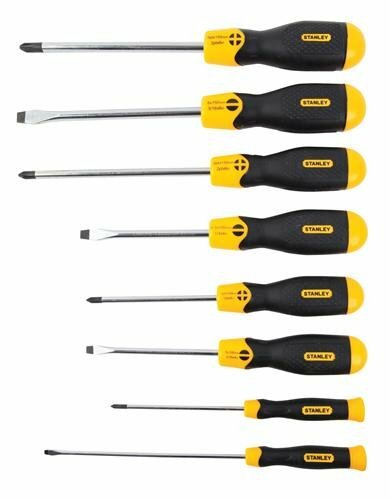 This unique screwdriver set is affordable and convenient, and many users keep it around their house or office as a simple tool to use for quick fixes. If you’re looking for a convenient, affordable and portable ratcheting screwdriver set, the STANLEY 69-189 is a great choice. Ratcheting on a budget. If you’re looking for a ratcheting screwdriver set that is affordable and still provides all the standard ratcheting functionality, look no further than the STANLEY 69-189. With this screwdriver set, you can screw and unscrew in both forward and reverse directions, and you can also lock the ratcheting function altogether. Quick release mechanism. The six bits included in this ratcheting screwdriver set are easily interchangeable using a magnetic bit holder. This bit holder also features a quick release functionality so you can easily and quickly switch bits out for different applications. 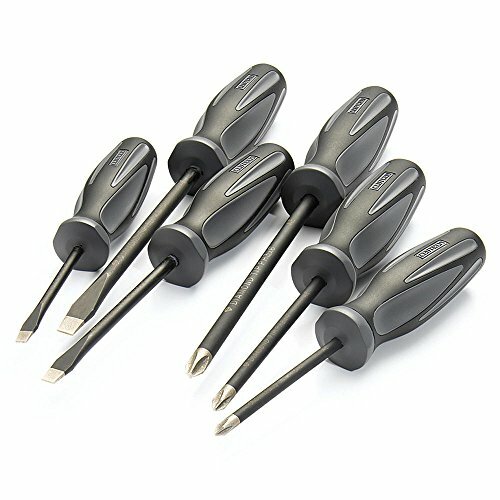 Many users are pleased with this functionality, stating that it increases the efficiency of using this screwdriver set. Comfortable handle. The handle on the STANLEY 69-189 ratcheting screwdriver set is extra comfortable, according to many users. With such a comfortable handle, you can expect to be able to use the screwdriver for longer periods of time without hurting your hands. In-handle bit storage. The handle on this screwdriver set also features a unique bit storage compartment. This is one of the reasons the handle is so large, but it also provides a convenient way to store the included bits so you’re not losing them. Bits aren’t magnetic. The six bits included with the STANLEY 69-189 aren’t magnetic. If you work a lot in cramped spaces, but still need the utility of a standard screwdriver bit, you may want to consider purchasing a stubby screwdriver set. These screwdrivers offer full-sized bits with a much shorter handle and shaft, hence the “stubby” name. With stubby screwdrivers, you can reach places that would be otherwise inaccessible with their full-sized counterparts. These screwdrivers work especially well in HVAC and auto-mechanic applications, where working areas are typically smaller and tighter than normal. The Performance Tool W80004 is a stubby screwdriver set with four different screwdrivers that you can use in hard-to-reach spaces. With this extra flexibility, you can add more flexibility to your tool set. These screwdrivers are also incredibly durable and super portable, making them a good addition for any professional, or home DIYer. If you’re looking for a stubby screwdriver set with added grip and control, look no further than the Performance Tool W80004 stubby screwdriver set. Perfect for hard-to-reach spaces. The Performance Tool W80004 is a stubby screwdriver set that is perfect for screwing and unscrewing in hard-to-reach spaces. Measuring in at less than three inches wide and five inches long, these stubby screwdrivers are small enough to handle precise jobs that still require a standard-sized screwdriver bit. Incredibly durable. These stubby screwdrivers’ shafts are made from chrome vanadium. Their handles are also made from hard, durable plastic. These durable features make this screwdriver set a long-lasting option. Many users report getting a lot of use out of these stubby screwdrivers, even after extended periods of use. Super portable. Since these screwdrivers are so small, they are also super portable. In fact, users report being able to hold all four stubby screwdrivers in the palm of their hands. 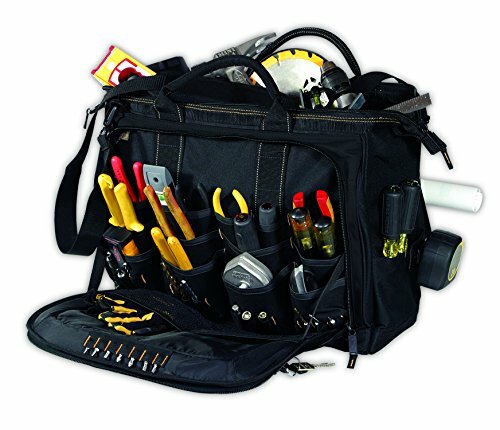 Since these are so portable, it’s incredibly easy to store them in tool bags and tool belts without taking up too much space. Handles provide greater grip. The Performance Tool W80004 stubby screwdriver set features convenient grooves on the handles that give you a greater grip while screwing and unscrewing in hard-to-reach places. The grooved handles on the screwdrivers also add to the overall comfort of using the set, according to many users. Smaller than standard stubby screwdrivers. While stubby screwdrivers are meant to be small, this set is smaller than most others on the market. According to many users, this “mini” size makes these screwdrivers a little harder to use.